“Slaughterhouses, as well as butchers who sell meat in the open, are putting consumers’ health at risk. Police must act on a suo-moto basis against illegal slaughtering of animals instead of waiting for someone to file a complaint,” pointed out the Bombay High Court. *Countless numbers of animals are slaughtered on a daily basis in India without following proper hygiene practices and guidelines for meat handling. Even the basic Food Safety and Standards Act requirements are not fulfilled. The health of the people who consume such meat is at risk. *India is home to a large number of licensed slaughterhouses. Plus, there are shops and meat traders who slaughter chicken, bullocks, buffalos, sheep, and goat right on the streets every day. Prevention of Cruelty to Animals Act (PCAA) makes it mandatory for butchers to get the animal’s medical check-up done and ensure that it remains unconscious while being slaughtered. But, these and other guidelines are not followed while slaughtering. Thus, the meat extracted often becomes unhygienic and affects the health of the people who consume the same. *To curb the violation of these laws, activist Laxmi Narayan Modi had filed a petition in the Supreme Court in 2013. Accordingly, in January 2014, the Supreme Court urged states and union territories to stop illegal slaughtering of animals. It had ordered the administrators to create slaughterhouse monitoring committees consisting of members from Municipal Corporation, pollution control board, as well as the animal welfare board. States did form committees to look into the issue. However, these committees have failed to serve the purpose. Thus, the Bombay High Court, in October last year, hit out at the Maharashtra state government and urged it to ensure that the Food Safety and Standards Act, as well as Prevention of Cruelty to Animals Act provisions, are not breached. *Thanks to the Prevention of Cruelty to Animals (Slaughter House) Rules, 2001 and clauses from the Food Safety and Standards Act, all the slaughterhouses need to ensure the premises are cleaned multiple times as per guidelines. Appropriate temperature needs to be maintained inside the building, and cleaning facilities need to be in place to make sure that the meat remains hygienic. Such food items deteriorate fast, so, slaughterhouses are also required to maintain cold storage facilities. Transport vehicles with a temperature control system are essential for transporting food items. *Besides the above, some regulations prohibit the sale of meat and meat products in the open. But, laws are violated on a daily basis. Animals are slaughtered illegally, and their carcasses, as well as other waste (along with blood), are thrown on roads or in the drain. Such practices cause pollution, impact the environment, and also put meat eaters’ health at risk. *Nothing much changed since the last year’s order. In January, while responding to another petitioner Arun Kabadi’s plea regarding the police’s inaction on their complaints, honorable Bombay High Court Justice S C Dharmadhikari reprimanded all those involved in illegal slaughtering of animals. 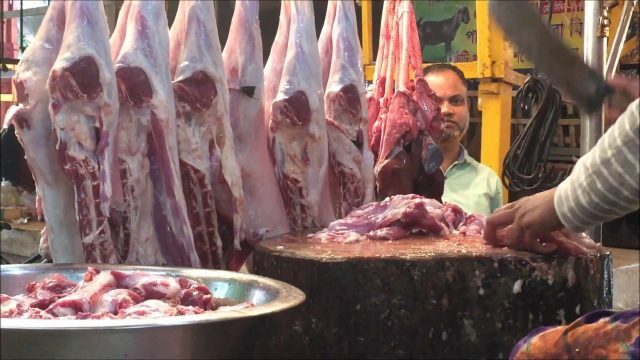 *While hearing public interest litigation against illegal abattoirs recently, the Bombay High Court’s Justice Satyaranjan Dharmadhikari strongly condemned such practices. He pointed out that meat is hung and sold openly on the streets. Some butcher shops throw their garbage, including carcasses on the road, and this makes it difficult for people to walk. Its odor spreads quickly, and meat hanging can cause psychological issues to people who come across the same. *Justice Dharmadhikari not just asked the BMC commissioner and police to look into the activities of the committee and file an affidavit but has also warned about taking strict action in case if the authorities fail to do so within the given timeframe. The honorable court urged the police to take action on a suo-moto basis instead of waiting for someone to file a complaint. *Individuals who consume such unhygienically handled meat face serious health issues. Thus, acting against persons who fail to follow proper laws has become necessary.